His place of birth is Kithalagama , Matara. His name at birth was Indikatiya Hewa Kusumadasa. Believe it or not , unless it is a joke , he was a monk during his young days. His name then was Kithalgama Mahanama .While wearing the robe he entered the Kelaniya University and secured a degree in economics. Lo and behold ! what happened thereafter ? he gave up his robes , and changed his name again to Indikatiya Hewa Kusumsiri Mahanama. While he was in the University he was a staunch JVP activist- imbued with socialism . After his University career , he somersaulted to the SLFP. Thereafter , he successfully completed the SLAS examination , and his first appointment was as Agalawatte district secretary. Subsequently during the period of president CHandrika through the SLFP connections he secured a secretary post under her. His wife too at that time worked in Chandrika’s secretariat . Prior to his association with Chandrika , Mahanama was residing in Ragama . Afterwards , with the aid of president’s powers he obtained a flat in Summit official quarters , Colombo , and his two sons attended Royal College. As both husband and wife were under Chandrika , they made hay while the sun was shining . After selling the Ragama house , he bought a property in Wewelduwa; bought a shop at Thorana junction , Waragoda , Kelaniya , and more lands . Mahanama then became a secretary of Mahinda Rajapakse during his corrupt era. During that period he constructed houses on the lands in Wewelduwa and sold them , and carried on a business. During that same period he went To India and obtained a doctorate degree. Interestingly that was the time ruffians and rowdies too acquired doctorates including Mervyn Silva . 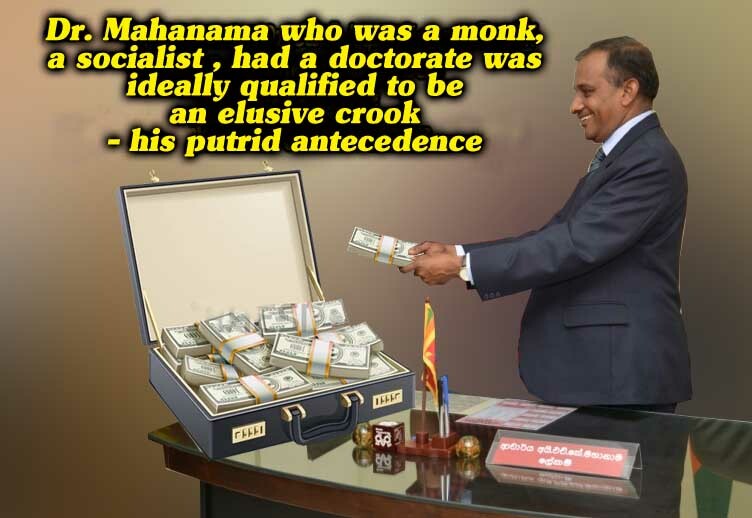 Mahanama’s Indian doctorate however is surrounded by suspicion . In any case fake or not that enabled him to call himself as “Dr. Mahanama”. During the corrupt Rajapakse era , Mahanama earned illicitly and infinitely like the Rajapakses. Mahanama who purchased a land along Kandy Road , Kelaniya constructed a mansion which a government servant can never dream of with his monthly salary during his entire lifetime. It is worthy of note , salary of a most senior secretary of the SLAS is less than Rs. 140,000.00 per month (inclusive of allowances) .One looking at the mansion of Mahanama one would certainly agree that even if the official salary per month of Mahanama is twenty fold more , such a mansion cannot be constructed out of his official earnings. He fetched all his family members from Kitalagama to give them residence in Colombo and Gampaha . In addition he found employment for them .The worst part ! his younger sister (loku nangi) failed in mathematics at the G C E O/L , yet she is become a Vice principal. (now retired) Those are the Fake Doctor Mahanama’s achievements . Then came the good governance government , and he became the permanent secretary of Lands ministry . During those days , he took his two sons and went to Japan. It was Sunil Gamage who was with ex president Rajapakse who helped him. Now his elder son studied in Australia. The post of secretary lands ministry is rife with opportunities for bribe taking . It is through him lands are granted to investors. Bribery being his favorite hobby he earned unhindered and without limit. But those did not come to light . Crooks and the corrupt get caught but once only after they have committed a series of such crimes. Possessed of all the qualifications characteristic of an elusive crook. While he was the secretary of Lands ministry , his time for retirement arrived. In any event , he was possessed of all the habits and traits of a downright elusive crook : he had worn the saffron robe, he was a socialist , acquired a doctorate degree, and while working under two presidents of the country he also had learnt the methods to suppress all his monumental corruption and illicit earnings. It is despite all these evil propensities and his preoccupation , president Gamarala who is best noted for appointing misfits to high posts gave him an extension in service and made him the chief of staff of his division. Lanka e news has always acted in good faith when criticizing and exposing Gamarala’s grotesque conduct and rackets. It was all in the best interests of the nation and himself. However if he still persisting in his old ways which he does not want to mend despite our sincere constructive criticisms , it is because Gamarala during the last 18 months remaining of his term wants to earn the maximum on the sly , and towards that goal it is such scoundrels like Mahanama he most needs. Bribes were as a rule collected after flying to Singapore and Dubai , on this occasion the venue was suddenly changed to SL at Taj Samudra hotel which is close to the presidential secretariat ,because the culprits had long experience of collecting bribes with the president close at hand . Unfortunately however that day was most unlucky to State leaders, and things went awry even to President Trump . On that day Trump was being vilified in America over his scandalous involvement with a whore while President Gamarala’s reputation was sullied and torn into shreds in SL after his closest cronies including his chief of staff were caught red handed collecting a bribe of Rs. 20 million. Gamarala realizing the odds are heavily against him , is now making loud announcements that maximum punishment shall be meted out to these two culprits (of his). If that is so , then why did he give an extension in service and take into his fold a crook with such a putrid antecedence ? Is it to lift and lick him or is Gamarala the well known ignoramus pretending he is not only innocent but an infant who knows only to cry for mother’s milk ? It is well to remind Gamarala that people have not forgotten , by Gamarala chasing out the Bribery Commission Director general Dilrukshi who trapped Gothabaya and summoned him to court, clearly demonstrated his own evil proclivities and lawlessness unbecoming of a president . If Bribery and corruption which is reigning supreme in the country is to be stamped out , expeditious legal action shall be instituted and deterrent punishment shall be meted out. Their pension should be stopped and all their assets earned illicitly shall be confiscated in order that the other government servants will dread to ask for a bribe, let alone accepting it. What will happen to Gamarala the day he is divested of his immunity is a foregone conclusion.